Your foundation or slab floor is moving upwards, leading to cracks in the walls and floors of your home. Solutions can be as simple as repairing a plumbing leak under your foundation -- or as extensive as demolishing and then reconstructing damaged sections of foundations or slabs. A professional foundation contractor is the best person to evaluate foundation heaving problems and suggest suitable solutions. We solve foundation heave problems! Call us for a free slab or foundation upheaval repair quote today! We serve Superior, Duluth, Minneapolis, and many nearby areas in Minnesota and Wisconsin. Heave is the upward movement of a foundation or slab caused by underlying soils that expand or swell. This occurs due to an increase in moisture or by freezing forces. Heave is more common with slabs than foundations because slabs have less weight to resist heaving forces. Unless there is a long period of drought, heave most commonly occurs within the first few years of the building's construction. A house built on soils with high clay content will be susceptible to heaving forces because clay-rich soil expands significantly when it gets wet. The excavation for a foundation often gives the soil around and under a house a chance to dry out and shrink, as shown in the photo at right. After the house is built, clay-rich soil that gets soaked during wet spells can cause heaving problems, while also damaging foundation walls. Water increases about 9% in volume when it freezes, wet soil can expand by at least that amount upon freezing. When this happens, the resulting pressure on a slab or foundation can cause it to shift and crack. The colder the temperature, the deeper the soil will freeze. In frigid temperatures, foundations that were not built below the "frost" or freezing line. Frost forces can lift a foundation upwards dramatically, sometimes by several inches or more, leading to serious frost heaving damage. to a foundation. Leaks or breaks in plumbing lines that run underneath a concrete slab or through a foundation wall can deposit moisture underneath the foundation and slab. This moisture can be from supply lines, waste lines, or even HVAC systems. Over time, this moisture can cause the soils underneath the foundation to expand, which will then cause them to push up on the structure above. Too much precipitation combined with too little drainage away from the house will lead to increased moisture underneath your foundation. Moisture that comes into contact with expansive soil can result in heaving of your foundation and slabs. Precipitation can also cause expansion in the soils on the sides of your foundation, leading to bowing, buckling walls. Cracks on floor slabs that are caused by foundation heave are unique in appearance. You will see multiple cracks that come together to a point or form an enclosed loop where the heave is greatest. Before doing any repairs to your foundation, it's important to identify the problem as heaving. Some contractors who have not been fully educated on the signs of heave can easily misread the cracks in your home and suggest the wrong solution. The problem? While heave is the opposite of foundation settlement, the symptoms are often similar. To an untrained eye, it may appear that the exterior walls are going down -- — when what's really happening is that the basement slab is being pushed up near the center of the house. To apply the right solution to a foundation problem, make sure you're getting the right diagnosis. More about sinking concrete slab floors. Start by having an experienced foundation repair specialist inspect your foundation issue and identify what is causing your problem. Once the problem is identified, a customized solution can be proposed to repair the damage and address the cause of the issue. We Do Foundation Heave Repair in MN and WI! At DBS, we have the tools and training available to fix foundations and slabs that are experiencing problems with upheaval. We offer foundation and slab heave repair quotes to all within our Minnesota and Wisconsin service area. If you would like to schedule a free, no-obligation appointment with one of our foundation specialists, call or e-mail us today! 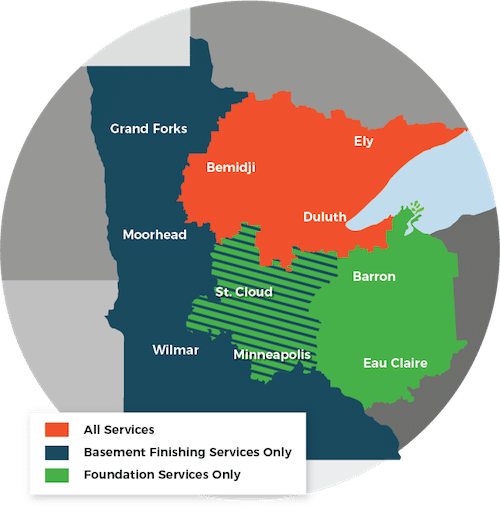 We proudly serve Minneapolis, Superior, Duluth, surrounding areas such as Cloquet, Two Harbors, Hermantown, St. Paul, Esko, Virginia, Ashland, and nearby.